Leading off today: So much for unprecedented. South Shore made PSAL history a year ago by winning city championships in both boys and girls basketball last winter. On Saturday, the Vikings repeated the accomplishment in the Class AA title games. The boysknocked off Thomas Jefferson 71-70 for the program's first back-to-back crowns. The girls made it five straight with a 42-37 victory against Harry S Truman. Seniors Kadary Richmond and Dwight Davis Jr. has 23 and 19 points, respectively, in the boys game. Trailing by one after giving back a double-digits lead, South Shore guard Femi Odukale dribbled the length of the court for a dunk and the game's final points as a last-second attempt by Jefferson missed the mark. Two free throws by Jefferson sophomore Jaquan Carlos had given the Orange Wave a 70-69 lead with 19 second left to set the stage for Odukale's bucket. Jefferson's Kareen Welch finished with 27 points, including 12 in the fourth quarter. He also piled up 11 rebounds and six assists. In the girls game, South Shore broke to a 13-point lead in the first quarter and never looked back after buckets by juniors Danaijah Williams and Chloe Wilson (16 points, 11 rebounds) shut down a Truman rally and gave South Shore a 23-14 lead in he second quarter. More PSAL finals: Frederick Douglass Academy won the Class A championship with a 59-51 win over New Dorp. Derek Jeter Mejia Hernandez delivered a key 3-pointer to make it 53-48 with under a minute to go to seal the victory. South Bronx Prep won Class B by edging Fannie Lou Hamer 54-47 as sophomore Steven Turner scored 19 of his 22 points after halftime. Fannie Lou Hamer led 36-33 entering the final quarter. In Class A girls action, James Madison took home the championship by edging Medgar Evers 56-49. In Class B, Brooklyn Law & Technology avenged a buzzer loss from a year ago by overwhelming Adams Street Academy 59-32. 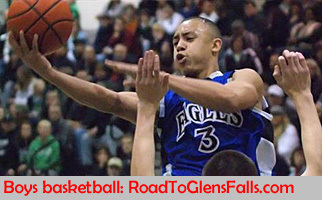 NYSPHSAA boys: Believe it or not, there were championships determined after Glens Falls' 75-74 win over Lowville in the Class B final. In Class AA, West Genesee earned its first state championship by downing Brentwood 70-57. Wildcats junior Will Amica led the way with 26 points, while Lucas Sutherland added 19 points and six rebounds. Amica scored 16 points as the teams went to halftime tied at 30-30. Sutherland connected on a fourth-quarter 3-pointer that broke the game open. In Class A, Poughkeepsie rallied past Pittsford Mendon 69-59 for its first New York State Public High School Athletic Association title since 1995. Trailing by four midway through the fourth quarter, the Pioneers went on an 8-0 run on the strength of two Niyal Goins (15 points) baskets. The Vikings closed within 60-57, but Tremell Reaves hit a shot while being fouled to end the threat. Jamik Carter led the winners with 17 points and Jaquan Pearson had 16.
open gym, we said mental toughness was going to be the biggest key and if we stayed strong together and had mental toughness, we could accomplish some great things." NYSPHSAA girls: Irvington's 71-38 rout of Midlakes in Class B at Hudson Valley Community College gave the Bulldogs their sixth state championship. Irvington rolled out to a 34-9 lead at the half and the advantage reached the low 40s before it was over. Junior guard Abby Conklin scored a game-high 20 points on the strength of five 3-pointers and also had five steals and four assists. Sophomore center Grace Thybulle connected for 16 points. In Class C, Cambridge downed Watkins Glen 57-43 to capture its first state championship. Watkins Glen made four 3-pointers in the first quarter but sophomore Sophie Phillips had 12 of her team's 19 points in the second quarter as Cambridge went up by a point. Watkins Glen would score just 12 more points the rest of the way as Cambridge took control. Phillips finished with 24 points, 17 rebounds and six assists. The point guard also blocked three shots. In Class D, junior Dani Haskell struck for 29 points as Franklinville earned a 61-47 win over Edwards-Knox. Franklinville dominated in rebounding 46-27 and held Edwards-Knox to 17-for-63 shooting (27 percent) from the field. "Defensively, I thought we were fantastic," Franklinville coach Allan Dunlap said. "Every team we play extends and puts so much pressure on Dani so it's never fun, it's always a fight for everything we get ... every time we step on the floor."